Not being a LEO or otherwise exposed to training that might include shooting at night I can say that my experiences with night shooting have always been informal and somewhat rural (shooting the skunk that was living under our porch one summer with a 20 gauge at about 9:30 at night when I saw him out by the creek). That said, unless you have your own range or attend training that focus on night shootings the opportunities are somewhat limited. To that end several months ago my home shooting club started a monthly night shoot for members (and their guests) to come out for a structured evening of shooting in a low light/no light environment. What follows is my quick summary of what I experienced last night. First thing to note is that it's not a completion, rather it's an opportunity to learn what happens at night when you fire a gun, test out your equipment and yourself, and gain some practical knowledge with which to move forward. The focus throughout the entire shoot was on safety, the shoot officers did a great job instilling that and at the same time trying to make it enjoyable for all involved. For that reason shooting from a holster was not allowed, however I do hope that as this event gains traction we might be able to incorporate it for repeat shooters who have proven their ability at prior shoots. For the time being though I understand the club's position. Meeting time was 5pm, this gave enough time to get stuff set up before sundown and allowed for some conversation between the shooters and the shoot officers. At this time the officers went over the rules and had a thorough safety brief. For last nights event we were shooting both pistols and shotgun. There were four of us shooting pistols and five shooting shotguns. We decided upfront that we would shoot the pistol round twice, the first time with night sights (NS) only, and the second with lights, lasers, etc. A round was 50 shots from three distances; 20 rounds from 3 yds, 20 rounds from 7 yds, and 10 rounds from 12-13 yds. Shotgun would be 12 shots per round, four from each of the three distances. 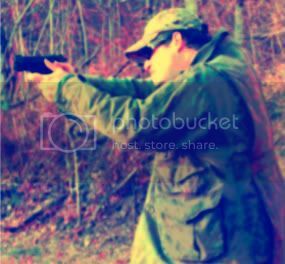 First up was shotgun, I was shooting my Benelli Supernova Tactical. Load two rounds with two more either on the gun or in a pocket, on the fire command fire two rounds, reload and fire two more. Being behind a shotgun at night (in my limited experience) is always fun, but with a short barrel it's even more fun. Not being able to see any sights just compounds the issue. On top of this it was evident very quickly that I need to work on my reload skills with a shotgun. It's not something that I've ever spent much time doing (the shotgun isn't my primary HD weapon); regardless if I even think I might use one in the future I need to get this down. Also, the need to be able to carry rounds in a known orientation on the gun is much clearer now. Trying to dig into your pocket for a reload is not something I ever want to have to do if I'm under stress. Despite all this my hits were decent and I feel confident that I could stop a threat, but again it's not my primary choice. I'll be looking into Ghost Ring NS and a sidesaddle for the gun. Next up was the pistol portion. For this first round I decided to use my P30 equipped with Mepro NS in 9mm shooting my own reloads. For this portion you were paired up with another shooter; while one person shot the other person coached/attended the shooter. What does that mean? Each person had a small two-tray caddy that I call a cleaning/custodial caddy. On one side you put your box of ammo (ammo had to be in a box) and on the other you put your unloaded gun with a chamber flag. The caddies had reflective tape on each end, red was the muzzle end and was to stay pointed downrange, and white was the rear end. Once on the line the shooter retrieved his pistol and kept it pointed down range, the coach would then load the mag. Each stage was a five round stage, so the coach was loading five at a time; because the ammo had to be in a box/sleeve it made it easy to verify where in the round you were and for the shoot officers to do spot checks. Doing it this way allowed the shooter to focus on keeping the gun down range while the coach was fumbling with rounds in the dark. Once the mag was loaded on the shoot officers instruction it was handed to the shooter and the gun was charged and held at low ready. For each five shot stage there were commands of various strings of fire and round count. Being night it amounted to more or less body shots and head shots within a given time frame. None of the times were especially difficult to meet but you did have that little internal clock telling you not to dawdle. As with the shotgun the flash of a round going off in almost complete darkness is something that I've had very little exposure to. To be able to do it in a controlled environment was great. Pushing back through the distances the shots got a little tougher to see as the target faded into the black background. At the end of it though I was very happy with my results. For the second round we went full lights/lasers/red dots etc. This time I was shooting a brand new VP9 (full FDE) with a Surefire X300U. Unlike my P30 this one does not (currently) have NS but instead has the HK luminous sights. I will say I was shocked at how much glow they had after coming out of the shooting bag already. However, prior to the round I hit them with my handheld light and that really gave them a charge that lasted through the entire round. Again as before we shot at the three distances with various courses of fire chosen randomly by the shoot officers. Again I was pleased with my abilities and the results. Shooting with a light was something I had never done before and just reinforced my choice to have one on any HD weapon I may plan to use. At the same time I am very seriously considering adding a Streetlight TLR-7 to my EDC (P30sk) as it greatly increased the ability to see and recognize your target (duh). The other thing that this event demonstrated to me was the need to upgrade the VP9 and another pistol that occasionally makes it into rotation with NS, not because the HK luminous sights are bad, far from it actually, but because more likely than not if I ever need a gun it will get pulled from the bedside safe or holster with no chance to charge the sights as I did last night. For that reason I want NS that are ready to go. All in all a very enjoyable and educational experience. I'm grateful that my club has added this to the list of sponsored events and will take the opportunity to make it out for one again in the future. Also plan to bring a couple guests next time as I think the chance to shoot at night was eye opening enough that everyone should make an effort to do so. Below are some gratuitous pics of guns/targets. Thanks for the writeup, and congratulations on being able to do all that. It seems that few people ever have the opportunity, and yet it’s an important experience. Although I fully understand why elaborate safety measures were followed, hopefully things will progress in the future to permit handling the guns in a more natural manner. I believe that being required to perform all aspects of handling the gun in addition to firing it in the dark is an important and valuable part of the training. In the low light training I conduct, shooters are required to clear malfunctions and reload in addition to drawing from the holster and moving as appropriate while also operating their lights. Even simple things like reloading that have been practiced many times become more difficult in the dark; that’s especially true if the shooter is accustomed to seeing what he’s doing, such as looking at the magazine well when reloading. For extra fun, do it in cold weather as well; temperatures in the teens add spice to the whole thing. We had a night shoot at my pro steel club a few months back. We were using PCCs, not pistols, but we learned a lot. First off, it gets DARK in unincorporated Red River County after the sun goes down. You have to point your weapon while scanning for targets, you can’t just scan with your eyes. In a close, still enviriornment, like a hallway, gun smoke will obscure your targets after only a few rounds. Your light will be reflected back like headlights in a fog bank. Yes, reloading and clearing malfunctions take on a new level of fumbling. Those lights that clip on the bill of your ball cap? Pretty much useless since, once you mount your rifle, they point at your gun, not downrange. Although I fully understand why elaborate safety measures were followed, hopefully things will progress in the future to permit handling the guns in a more natural manner. It's been a matter of baby steps with the club. It wasn't until about a year ago that an IDPA/USPA-ish monthly pistol match was approved. The club is mostly older folks and sometimes changing minds on things such as training and the benefits of it are an uphill struggle. Right now a lot of folks are laying the foundation for changes to come, just have to get some history in the books first. The day we moved back to TX from WY it was a balmy 13 degrees with a 25 mph "breeze" in Gillette, you can please keep that cold weather up there in that part of the country thank you very much. Sounds like a fun time and good experience. Considering the shooter's station had a specific place to lay the unloaded, locked back weapon, it does seem a bit silly to have the "coach" load mags for the shooter. But like you said, baby steps. Hope they keep doing it. A local non-USPSA club down here held a small night match a while back, but I was unable to attend. I'll have to ask if there is a chance of another one in the future. I had the opportunity to take two low light classes this year, and have a VCQB + Low Light on 28 Dec. I've found, light on the gun is clubbing baby seals. Hand held gives me all kinds of issues, shadows on sights, etc. I often have what I think is the correct sight picture, but when I burn one off I get no ping from the steel. I'll need more time and work on it. In my last night shoot, I used my Carry Optic M&P Core with a Streamlight TLR-1s. Certainly more accurate and controlled fire compared to the hand held scenario. I could switch to weak/strong hand and retain illumination of the targets, the RDS increased hit scores, prevented engaging no-shoots, and was faster overall by a wide margin. 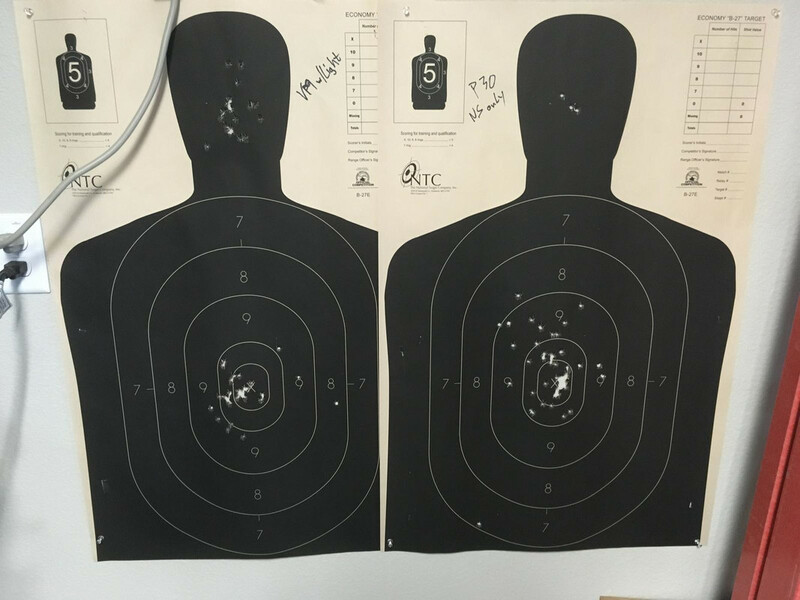 I also did't experience the loss of sight alignment, the dot gave me increased confidence in shot placement. This is all on the clock, light rain and black as Hades. I did discover I needed a better holster for the mounted light. If you have not done a night shoot, it really is a good test of your ability in a dark scenario.